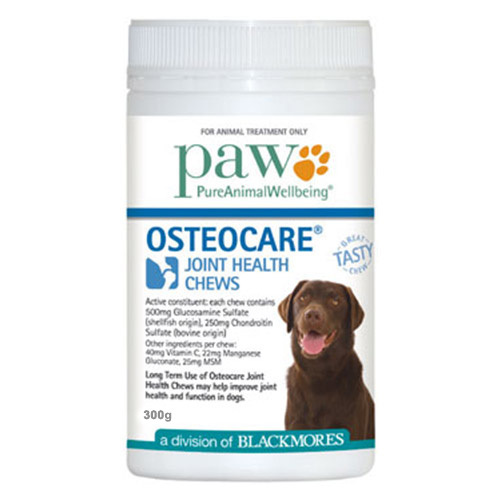 Paw Osteocare Joint Health Chews are tasty kangaroo chews that are intended for daily joint care. They aid in improving joint function and health in younger and older dogs with early arthritis symptoms. It consists of Glucosamine Sulphate and Chondroitin Sulphate that provide cartilage nutrition for optimal joint cartilage health and joint function. The chewable also consists of other ingredients like MSM and a balanced blend of vitamins and minerals that work together to maintain the health of your dog’s joints. This dose is also suitable to aid joint health in younger dogs that have a pre-disposition to joint problems later in life. This product really serves the purpose for my dog. My dog is arthritic. It's been two weeks that I started giving him paw osteocare and I can see his condition has improved since then. Living in Minnesota is quite hard. And my fido does get affected easily by the chills. I keep paw osteocare to give him some relief in the snowy winters. So far it has kept him moving. Recommend this product to other natives as well. Shiny, is my young dog. But she is suffering from arthritis and limps a bit. After I started these chews, within few weeks she stopped limping. This is an amazing product, I give her the chews to cut down her pain.